One Kit for a new mom's entire stay! 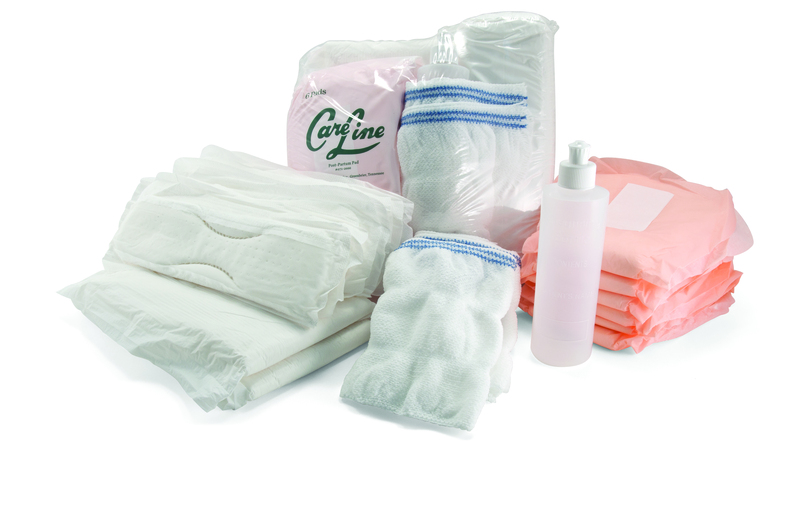 It eliminates multiple underpads, minimizes product going home with the patient, and provides the specific, ideal product mix for maternity needs. The new mother is protected against embarrassment with pads that are superior in function as well as comfort. The system actually provides for over 30 hours of post-partum protection, allowing her to return home without risk of leakage. Your nursing personnel are free from hassle, with a single kit that provides for a mother’s entire post-partum protection needs. Also, the pads are familiar and easy to use, eliminating training in older pad and belt procedures. These pads eliminate the need for both underpads and briefs. For the first four hours, pads are changed every two hours to measure flow and maximize tha patient’s comfort. These pads have a comfortable non-woven facing and a heavy fluff filler. Even while the patient is immobilized, the pad is easily placed and replaced. These pads are also changed every two hours, for the next 12 hours. This is a more compact form of the large post-partum pad, providing the mother with complete protection while she is ambulatory. As the lochia flow lessens during the next 24 hours, the patient can use these maxi-type pads. This allows the patient to return to a more normal lifestyle without sacrificing the protection of a proven maternity product. The patient uses mesh briefs with the maxi-pads.